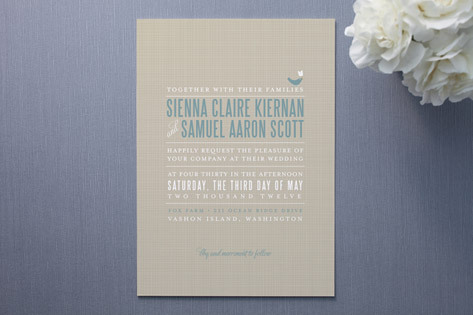 A lovely linen patterned background adds texture and charm in these modern wedding invitations by Carrie Eckert for Minted. Strong, modern typography and a cute little birdie complete the modern, whimsical look. Available colors include Light Denim (shown), Dark Fuchsia, Sage, and Ruby.